International Carrot Day is for carrot lovers around the world and is celebrated with the eating of carrots and the holding of carrot parties. It was created in 4th April 2003 to spread knowledge about this vegetable. Carrots are root vegetables. They are usually in orange color, although they may also be in red, purple or yellow. It makes sense that carrots are celebrated internationally as they are one of the ten most economically important vegetables in the world. This root vegetable, carrot is called as Gajar in hindi language. And in India, the winter is the best time to get fresh red color long carrots which are little bit sweeter than the orange ones. The most common and popular Indian dish using this is the Gajar Halwa or Carrot Halwa which is basically a carrot-based sweet dessert pudding. I have already shared an ice-cream using this humble carrot halwa as Carrot Halwa Ice Cream (VEGAN). Also one can surely enjoy some kheer or payasam using these root vegetables as Gajar Kheer or even a vegan soup as Carrot Turmeric Soup. Well today here is a cute snack dish using these carrots as Carrot mini Crescent Rolls. Completely vegan these are. The dough of the crescent roll is purely homemade, but one can skip the method of preparation of the dough and use store bought ones. Once the dough is ready, then kids will surely participate in the preparation of the rolls. These will absolutely a hit as party appetizer, kids tiffin box and even evening snacks. With desired sauce, one can thoroughly enjoy these cute ones. So lets go in details as mentioned below. Carrot (1 inch thick) 2-3 no. In a small bowl, first take Luke warm water, sugar and yeast. Mix using a spoon and keep aside covered for 8-10 minutes or till the yeast starts frothing. Meanwhile in a large mixing bowl take all purpose flour, salt and oil. Mix by rubbing in fingers and after that add the yeast mixture to the bowl. Mix everything now very well which results in a soft as well as sticky dough. Sprinkle some flour on the work surface and knead the dough for 4-5 minutes. Then put the dough in the bowl, cover and keep aside for 1 hours or more to rise the dough to double in size. Meanwhile, wash and peel the carrots. Cut all the carrots into 2 inches lengthwise and transfer to a bowl. Add some salt and pepper powder to the carrots and give a mix. Keep aside. When the dough rises well to double in size, take out from the bowl. Give a quick knead to the dough and cut into two halves. Preheat the oven at 190 deg C.
On a well dusted (with flour) work surface, roll one half of the dough into a circle of 1/4 inch. Then cut the circle into quarters and again cut each quarter from center into 3 equal portions (seems like 3 triangular portions). Place one carrot piece at the wider side of one triangular portion of the dough and roll up along with the dough towards the pointed end. Place the crescent upon a baking tray lined with parchment paper. Similarly prepare some more crescent rolls using carrot pieces and rest dough. Place all the crescents on the baking tray keeping small gap in between. Brush each crescent with oil and sprinkle some poppy seeds. Take out from the oven and serve along with desired sauce ! Do check the freshness of yeast before adding to the flour. If it is not proofing, then the yeast is old one, throw out and do buy a fresh packet. Prefer to use thin carrots of thickness around 1 inch. So for using, just cut lengthwise and roll in the dough. If thick carrots are taken, then the carrots are to be first cut into finger size. Any other flavor oil can be used here. If you tried my recipe and enjoyed fully, then please share some pictures of your creation with me. Also kindly rate the recipe below, give your valuable feedback either in the comment box below or tag me as @firsttimercook on Instagram. 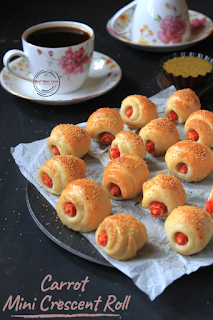 This Carrot mini Crescent Roll is contributed for 189th theme of the Foodie Monday Blog Hop foodie group which is decided as 'Carrot ka jalwa' and suggested by Poonam who blogs at Annapurna. 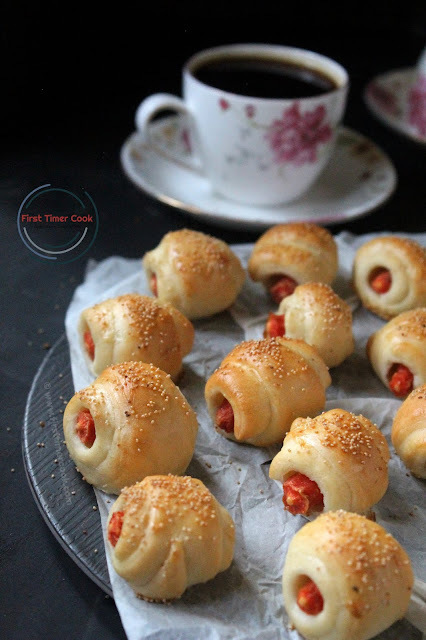 The carrot mini crescent rolls look absolutely adorable Sasmita! Beautiful photographs tempt me to try this recipe soon . Oh, these rolls look so adorable! I'm sure they tasted delicious too, with the carrot stuffing. :) Awesome recipe. I have yet to get my oldest daughter to like carrots. Maybe she will eat these. I know the rest of the family will. These are the cutest little vegan rolls (ie, vegan pigs in a blanket!). Love that you can feel less guilt too when eating these! These would be the ideal alternative to sausage rolls as a meat-free option for a dinner party. these are so cute! it's like the perfect mini appetizer - love the carrot in the middle! Beautiful click Sasmita. These rolls sounds delightful. Bookmaking it to try soon. Superb share. These rolls are so cute, reminds me of the ones that is usually made with mini sausages. Great vegetarian snack or appetizer. The dough on these little crescent rolls looks perfect -- so soft and pillowy. Love these as a fun spring appetizer. Thanks for sharing! I'd never thought to add carrots in crescent rolls but its a great idea! What a wonderful savory appetizer for any type of event! Wonderful recipe with carrots Sasmita. These carrot mini crescent rolls are baked to perfection. Everyone will love to gorge on these rolls.Fabulous share. I love carrots and we eat them a lot. I like to roast them. 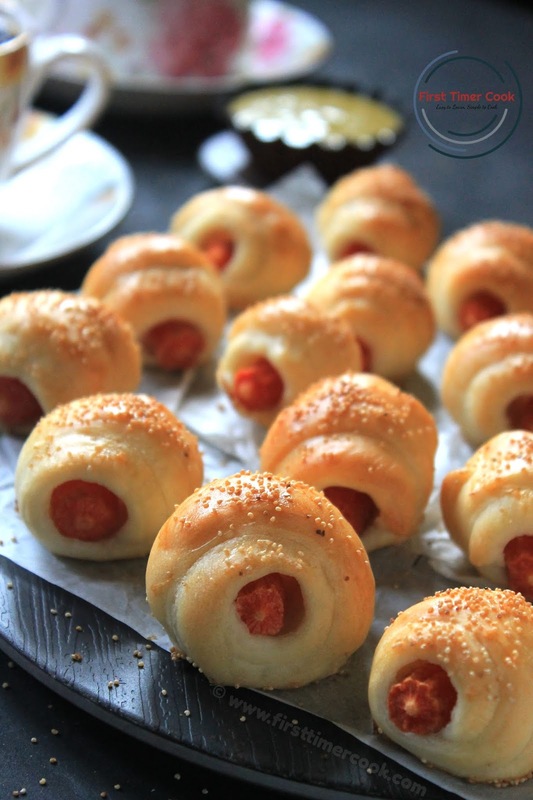 These carrot mini crescent rolls are such a great alternative way to eat and serve carrots. Looking forward to trying them! 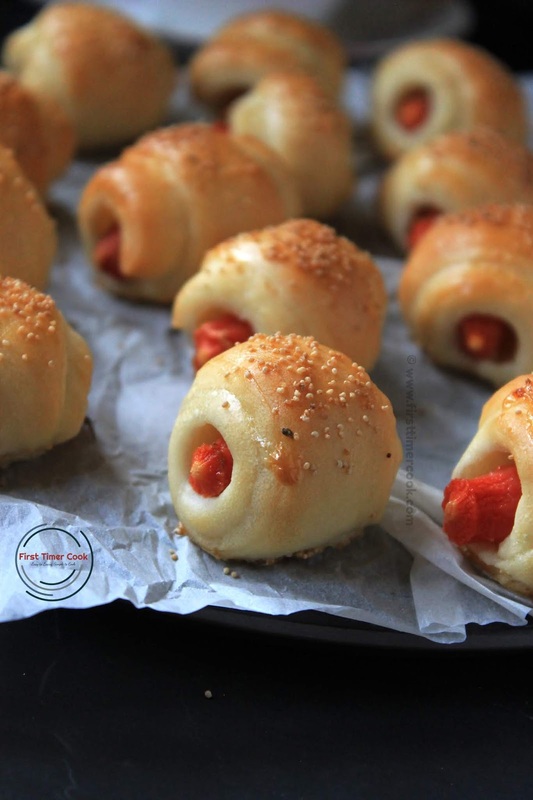 These carrot mini crescent rolls will make the perfect afterschool snack. I am always looking for new ideas to get my kids to eat more veggies. These are so cute! A perfect healthy and vegan appetizer. Yum! Haha, love the reason! 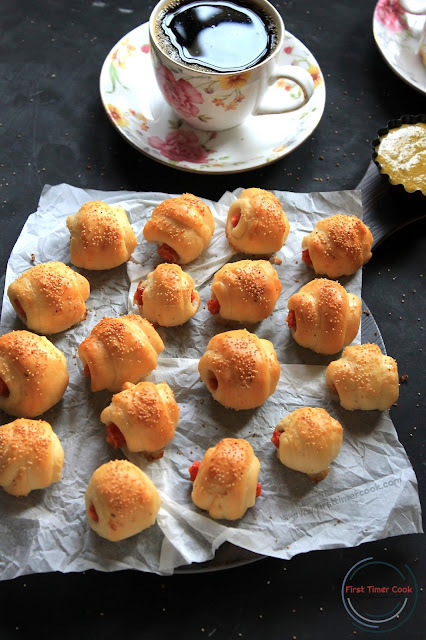 Such a cute occasion to make something as delicious as these carrot mini crescent rolls! Not only these carrot mini crescent rolls are cute and tasty but they are vegan and healthy - absolutely spot on! Great idea to add carrots to crescents, that would make a great snack for kids. These crescent rolls are so cute! Addition of carrots in these really make these even more appealing! !